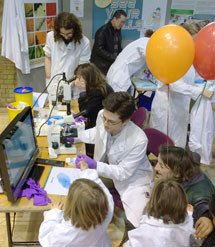 On Saturday 15 and Sunday 16 March over 50 LMB scientists helped to showcase LMB research during the Cambridge Science Festival. The LMB had three exhibits at the Science Festival: ‘See Your Cells’ and ‘Virus Wars – Antibodies Strike Back’, in the Cambridge Corn Exchange, and ‘Crystal Clear’ in the Chemistry Department. The exhibits were designed, organised and staffed by LMB scientists, and introduced visitors of all ages to LMB research including protein crystallography, microscopy and how antibodies detect viruses within cells. A variety of crystals, including the winning crystals from the Eastern Region ‘Crystal Growing for Schools’ Competition were on display at the ‘Crystal Clear’ exhibit, organised by Samantha Wynne from the Structural Studies Division. LMB scientists also explained how we use protein crystals and X-ray crystallography to determine the shape of protein molecules in order to try to understand how proteins function. At the ‘See Your Cells’ exhibit, created by Simon Bullock and Monica Rodrigo Brenni from the LMB’s Cell Biology Division, visitors could use microscopes to see their own cells and test their detective skills with the stereomicroscope challenge. 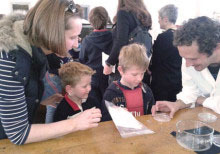 Simon and Monica also run Micrscopes4Schools, which introduces primary school children to cell biology using microscopy and aims to inspire teachers to perform similar science activities in the classroom. Visitors also had another chance to see the ‘Virus Wars – Antibodies Strike Back’ exhibit created for the 2013 Royal Society Summer Science Exhibition by Leo James’s research group from the PNAC Division. The exhibit organisers, Ruth Watkinson and Susanna Bidgood, plus a team of volunteer scientists showed visitors how cells are able to use antibodies to detect and destroy viruses, and challenged people to test their scientific skills in their containment hood speed pipetting game.